Strategically located – at the New Delhi Railway Station and the at the heart of the city centre, we offer 53 rooms and a rooftop restaurant . 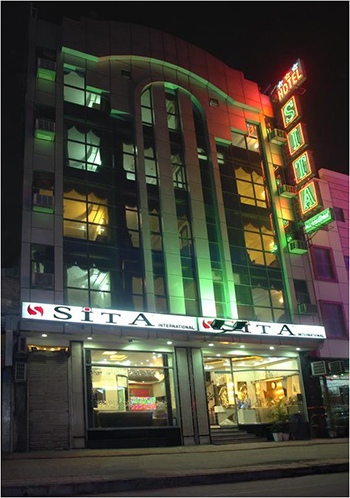 Since its inception in 2003, its been the must a stay hotel in Central Delhi. Its prime positioning helps travellers see both worlds of Delhi – the charm and nostalgia of Walled city e.g. Old Delhi and the colonial magnificence of Lutyens Delhi e.g. New Delhi. The hotel rooms are aesthetically designed to provide maximum comfort to a wide array of travellers – backpackers, corporate, family stays and large groups. The rooms are equipped with universal electrical sockets, tea coffee maker machine, safety deposit lockers , mini bars ,down pillows and free wifi access. Offering further value addition to our custom designed rooms ,are the hotel facilities on offer – round the clock room service, dedicated 24 hour concierge, buffet breakfast, elevator on floors , business desks and cloak room facilities. All services are standardised and aimed at achieving utmost value for money to the guests. Our location is in the midst of the - the majestic Connaught Place and the hustle bustle of Asia’s largest wholesale markets – Chandani Chowk, Sadar Bazar, Karol Bagh and Chawri Bazaar. Guests are in close proximity to the exhibition epicentre of Delhi – Pragati Maidan , facilitating seamless stays during their business meetings and exhbitions. Besides being at the New Delhi Railway Station we are well in reach of Delhi’s other major rail junctions such as Sarai Rohilla, Nizammudin and Anand Vihar Railway Stations, all in the range of 5 kms radius. Delhi’s must visit sights include – the Red Fort, Jama Masjid, Humayuns Tomb , Lotus Temple , ,Rashtrapati Bhawan, Qutub Minar and the Akshardham Temple. Amongst the top visited attractions in Delhi,5 are in the vicinity of the hotel, enabling easy access and connectivity to the UNESCO World Heritage Sites. The travel desk at the Hotel offers specially crafted activities to explore these ancient marvels. It ranges from a thrilling segway tour of the Presidents Palace, heritage walk through the Walled City , shopping spices in Asia’s largest spice market, lip smacking street food tours or a well routed cycle tours in Lutyen’s Delhi. Besides our curated activities, we do assist in arranging round the clock Airline, Railways and Bus Tickets for our guests.